The “Internet of Things” refers to the general idea of things, especially everyday objects that are readable, recognizable, locatable, addressable, and/or controllable via the Internet—whether via RFID, wireless LAN, wide-area network, or other means. Everyday objects includes not only the electronic devices we encounter everyday, and not only the products of higher technological development such as cars and machinery but things that we do not ordinarily think of as electronic at all such as a box of food or clothing. It is generally agreed that Kevin Ashton coined the phrase “Internet Of Things” in 1999 when he linked the new idea of RFID in Procter & Gamble’s supply chain to the Internet. “Individuals, businesses, and governments are unprepared for a possible future when by 2025 [if not even earlier] Internet nodes may reside in everyday things food packages, furniture, paper documents and more. Today’s developments point to future opportunities and risks that will arise when people can remotely control, locate, and monitor even the most mundane devices and articles”. “The Internet of Things will be inextricable from sensor networks that monitor things but do not control things. Both connected everyday objects and sensor networks both leverage a common set of technological advances toward miniature, power-efficient sensing, processing, and wireless communication. Analysts commonly describe two distinct modes of communication in the Internet of Things: thing to person and thing-to-thing communication”. “While it followed a different development path, The Internet of Things is the natural next step in the technology evolution after social media. Social media has allowed us to connect and process information in ways that are are very natural. In many ways social media has enabled us to come full circle and make our computing world increasingly transparent in the way we conduct our lives”. “The Internet of Things takes this to the next level, where not only do we have the option of connecting to people, we have the capacity to connect devices together to make our lives easier – devices that have no pre-ordained knowledge of each other”. “With the Internet of Things, we can, for example, allow our fridge and our rubbish bin to work together to order our groceries. We can let our car book itself in for service. We can spontaneously meet people for coffee simply because our phones have ‘seen’ each other in the crowd. Even our alarm clocks can decide when to wake us up if our plane is running late”. “Metcalfe’s law tells us that the power of a network is square of the number of nodes. This was true when the phone systems starting getting more subscribers – it will be even more true as people design their devices to participate in the Internet of Things”. Sense-T is a world-first economy-wide intelligent sensor network distributed across Tasmania, measuring all aspects of activity including energy, carbon, water, population and transport flow. Professor Paddy Nixon, Deputy Vice Chancellor Research, at the University of Tasmania (UTAS) told me that data gathered by the sensors can be accumulated through the National Broadband Network (NBN) to make meaningful deductions. Solutions can then be delivered which change the way the island and its society operate. Professor Nixon says the project is of national and international significance. The proposition is straightforward. A network of sensors collecting data linked with web sensing will enable decisions to be made in close to real time that previously couldn’t be made before at all. While NBN discussions are often about high bandwidth, Professor Nixon told me that he is more interested in the ubiquity of the NBN, which enables whole of state monitoring for social, government and business applications. “A world-first online sensor network set to drive economic, social and environmental benefits for Tasmania. The SenseT network will mesh together historical, spatial and real-time data and make it available through the web to the community”. “On a wider scale, this information could be used to monitor temperature or rainfall, or for flood and fire alerts. When integrated with maps and historical records this can be used to predict changes in the environment. It is the open access to information in a single system which will create opportunities for innovation and economies of scale”. Dual national Australian/American inventor Mark Pesce is currently working on a startup company that he founded last year called Moore’s Cloud which he hopes will become the ecosystem company for the Internet of Things. “MooresCloud makes the Internet of Things work, providing a write-once, run-anywhere platform for devices, services and apps. This is needed because right now the Internet of Things is a big, black box, filled with amazing devices”. “Like the Philips Hue – which can’t be dimmed, or turned off at the switch, or they’ll reset and forget everything they know … Belkin’s Wemo, a remote-controlled outlet, that makes you reach for your smartphone every time you want to turn it on or off … NinjaBlocks – a Sydney-based startup inviting consumers to become programmers and hardware hackers”. “All of these pieces are incomplete. None of them talk to one another. No coherence. No user experience. No market”. “MooresCloud has created the glue to tie these pieces together. A piece of software they call the Internet of Things Access Server, or IoTAS. IoTAS is the universal translator, a ‘Babel Fish’, providing a consistent, easy-to-use API for the Internet of Things”. “With IoTAS it becomes possible to take devices from different vendors and integrate them into a framework where they can be snapped together to create new applications, like so many Lego bricks. IoTAS is software. It needs to run somewhere, on something”. 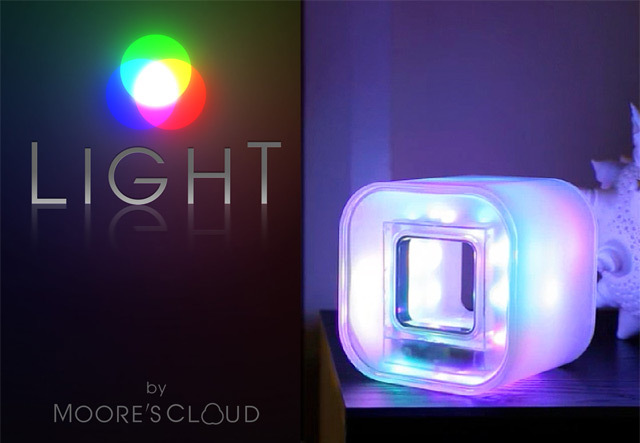 Moore’s Cloud’s first effort at making a IoTAS server is the Light by MooresCloud, which is currently in pre-order stage and will ship in July 2013.